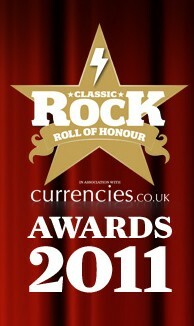 Music-News.com has uploaded a 15-minute video clip featuring highlights from the red carpet at the seventh annual Classic Rock Roll Of Honour, which was held last night (Wednesday, Novemebr 9) at the world-famous Roundhouse in Camden, England. The ceremony was hosted by KISS bassist/vocalist Gene Simmons. Guitarist Jeff Beck was awarded the highest accolade of the evening, The Living Legend Award, presented by Roger Taylor from QUEEN. MOTÖRHEAD‘s Lemmy, who picked up an award for his documentary “Lemmy”, told BBC 6 Music he felt “fine” after getting the prize but was shocked the film was received so well. “It was flattering they wanted to do it, I didn’t think it had a pony’s chance in hell of making it do anything and then it did,” he said. Fans voted QUEEN‘s reissues package of five albums the best reissues of the year, fighting off competition from THE WHO‘s “Live at Leeds” and DAVID BOWIE‘s “Station to Station” deluxe.